My cabinets are bursting with gadgets like this. Most are gifts from my husband, and thus difficult to unclutter. The worst? Ice cream maker! We are fortunate to have the garage storage so close to the kitchen. That is where all the “occasional use” items go. This is the waffle maker, Cuisinart, George Foreman grill, etc. Our kitchen is just too small to house it all. The problem is when your better half is a pack rat. So as long as there is room in the garage, there will be more gadgets. Still want a waffle maker, but want more capability? Get a George Foreman G5 grill. It has different temp settings to make cooking different cuts of meat better, a baking plate so you can make biscuits, the baking plate doubles as a griddle for pancakes, eggs, bacon and the like, and it has a waffle attachment. The 5 part of the G5 is that it comes with five diferent attachment plates. Our kitchen is strictly one-in-one-out when it comes to buying new gadgets. We use our waffle iron all the time, but admit that garlic roaster hasn’t seen the light of day in years. Waffle Iron and Ice Cream maker are my two most used appliances! Ice Cream on waffles is the best! Although I agree there are a lot of useless gadgets out their that TV cooks try to make us believe we need. I have thought about getting rid of the oven then I would have more cupboard space. 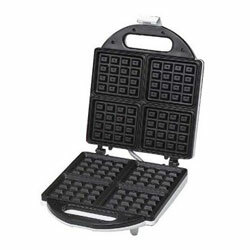 Our waffle maker has reversible plates that are flat on the other side, which means it is useful for more than just waffles, and gets used several times every month. How odd that I should read this post today. I just discovered that I can use my waffle maker to make odd looking but delicious panini style sandwiches. Two slices of bread with cheese and turkey breast between them. They don’t cook perfectly evenly — the hinge doesn’t allow for fat bread — but I fix that by turning and rotatin the sandwich halfway through. And I love the gridlines. Saves me the clutter of buying a panini maker, too. They are also great for hand to hand combat.. next time someone breaks into your home while you are in the kitchen, think fast and grab the waffle iron. You can pry my waffle maker out of my cold dead hands. Make a pancake. Throw it on the floor. Step on it with a boot. Enjoy. So let me get this straight… if you want something, just repress the urge and do without? I think you take things to extremes. We have waffles every Sunday without fail. They are super easy to make and the leftovers are great with some nutella. We use the waffle-maker a couple of times a month– perfect for feeding the kids a simple evening meal at the end of a looong day. But by the same argument, shouldn’t the blender go away? We use ours 3-4 times a year– but sheesh, once the kids are in bed early after a quick meal of waffles, a daiquiri sure tastes nice…. We have an ice cream maker and we don’t use it as much as we’d like. However, we’ve figured out how to shelve it so it is convenient and not buried under other gadgetry. We don’t crave waffles enough to necessitate an entire waffle iron device. If it doubled as a panini press and griddle, then perhaps I’d think about it. However, we just use our cast iron skillets to do the same thing. One less device in the kitchen! A waffle iron takes up about the same amount of space as a box of Eggos. What makes the one clutter and the other not? My parents eat a lot of frozen waffles (or else, they have a lot of frozen waffles on hand for the grandkids–it’s a bit of a Schroedinger’s Cat dilemma)–sometimes a significant portion of their entire freezer space is taken up by the boxes! And the rest is taken up by ice cream. They could probably replace their 2nd refrigerator with an ice cream maker and a waffle iron and come out way ahead. For people who take the alternative strategy: could you get rid of your second car if you made fewer trips to IHOP and Baskin Robbins? I make things other than regular waffles in mine – sweet waffles for dessert, cornbread waffles to go with chili, sweet potato waffles, banana waffles, sourdough waffles… if you look beyond traditional waffles, then you can make a ton of different quickbreads in the waffle iron. We hadn’t had waffles in a few months before last weekend, but when we do have waffles, we enjoy it very much. We enjoy it much more than our last trip to IHOP which was somewhat of a nightmare. Even if we typically only use it every other month or so, it is worth it to us, because hot, homemade waffles are a nice treat. Also, it’s great when you have guests. If there was a waffle maker that worked as something else… that would be great. I think I’ve seen waffle makers where the grids can flip over and make a griddle that you can close for grilling or leave open for frying stuff (like pancakes). Now if only I knew where one of those things were!